I wanted to play along with this week's Belles 'n Whistles Challenge to use red! 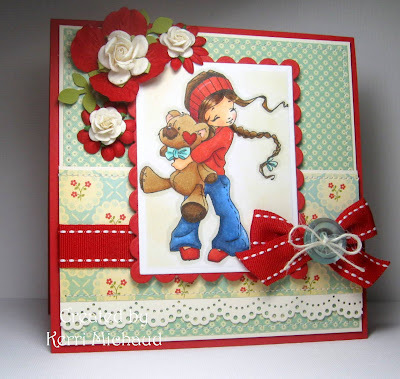 I used this adorable image called Beary Big Hugs, and some dp from the October Afternoon Thrift Shop paper pad. This is also for the Papertake Weekly Challenge~In Stitches and Totally Papercrafts Challenge~One For The Girls. Thank you so much for stopping by, and I hope you have a wonderful, dry weekend! Oh this is gorgeous Kerri!! I love your coloring of this adorable image and your layout!! The dp is beautiful!! Gorgeous all around GF!! Outstanding Kerri! Love your gorgeous coloring and design! Hope the weather clears up for some outdoor fun this weekend. Awww, darling!! I love this image and you've made it oh.so.sweet with these bolder colors! I adore this card! Oh my goodness is this ever soooo beautiful Kerri..I LOVE that paper!!! WOW!!! Oh gosh! This is so BEAUTIFUL! I love your choice of dp's and that lovely red bow is such the perfect touch! I love it! Wow! Stunning card. I love how you have used the red and you have coloured the image perfectly. Thanks for playing along with us at Belles 'n Whistles this week. What a darling darling card! Beautiful details and I really love how everything came perfectly together! LOVE IT! Thanks for joining the Belles N Whistles Challenge! BEAUTIFUL card! I love everything about it!!! Thanks for joining our BnW chalenge this week! This is adorable and your coloring is amazing! Love it. I love her read shoes and the red hearts on the beart cheeks. Your coloring is so pretty. What a sweet card, Kerri! Love everything about it! This girl looks like you colored her differently than others...like a different technique or something but it doesn't even look like you colored her, looks more like a real cut out picture or something...it's cool though.....and oh the pretty Primas are yum!